If you’re looking to move past the beaches and take a morning walk or evening drive at an alternate breezy location, near the East Coast Road, then Casuarina Drive, filled with lush greenery and dreamy bungalows is the lane to visit. Casuarina Drive in Neelankarai, minutes away from the Palavakkam beach is truly a walker’s paradise. Especially for those of you love gazing at pretty villas, rustic doors and enjoy a scenic walk by lanes beside the beach. One turn into the lane and you’re welcomed by vintage lampposts and many metallic & wooden doors. Minutes into the drive, you are sure to be taken back to Casablanca, California or say closer home, the posh villas from Banjara Hills, Hyderabad. Architecture lovers, could relax and unwind on the cement benches of the promenade. If you happen to visit during pleasant evenings, dog lovers, you can take a stroll along with the Great Danes taking their daily walk. Developed in the last fifteen years, the area has a mix of modern, glass, sophisticated and heritage homes. Though it is known to be a spot for photography enthusiasts as well, we suggest you do not plan any full-fledged photo shoots. Passersby are only allowed to capture the locality and villas from outside. If you’re lucky enough and especially for Ilayathalapathy fans, you might just spot actor Vijay exploring his neighbourhood on one of those random walks. The easiest way to get Casuarina Drive located in Kapaleshwar Nagar, Injambakam is by driving to the farther end of the Palavakkam Beach or even through the Blue Beach Road on ECR. 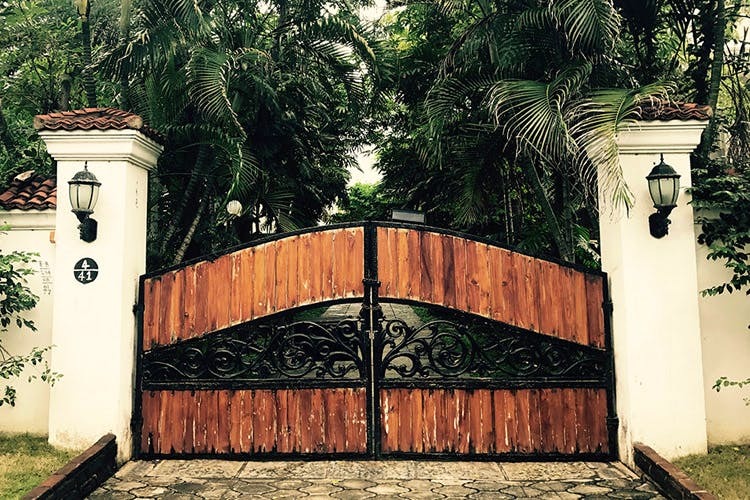 Personally, for someone who has always been intrigued by doors and entrances across Rajasthan and villages in Belgaum, Casuarina drive is a scenic experience. Especially since the road leads to one of the cleaner beaches of the city, walking here, even during the monsoons makes for such a lovely time! So, this weekend, make sure you take a break away from your usual route and walk by this hidden spot by the beach.